Nimonic 90 Chequered Plates Supplier, 90 Nimonic Hot rolled Sheets, B463 Cold Rolled Strips Exporter, Nimonic 90 Coils Dealer. Marc Steel is a known stockiest and trader of Nimonic 90 Plates,, which is a precipitation hardenable nickel-chromium-cobalt alloy strengthened by the addition of Titanium and Aluminium. 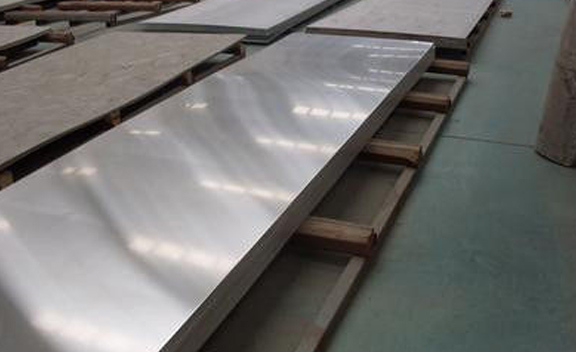 Alloy 90 Sheets is a Nickel-Chromium-Cobalt alloy being precipitation hardenable, having high stress-rupture strength and creep resistance at high temperatures up to about 950 Degree C (1740 Degree F). Nimonic 90 Sheets also has good resistance to high-temperature corrosion and oxidation. AMS 5829 Nimonic 90 Coils can be machined using conventional methods which are used for iron-based alloys. Alloy 90 Plates does work-harden during machining and has higher strength and “gumminess” not typical of steels. Heavy duty machining equipment and tooling should be used to minimize chatter or work-hardening of the alloy ahead of the cutting. Nimonic Din 2.4969 Plates is generally used for highly stressed components such as turbine blades, hot working tools and high temperature springs. NIMONIC 90 PLATE SUPPLIERS, NIMONIC 90 COILS DEALER, 90 NIMONIC HOT ROLLED SHEETS DISTRIBUTORS, DIN 2.4632 NIMONIC STRUCTURAL STEEL PLATE, ASTM B463 NIMONIC 90 COLD ROLLED STRIPS MANUFACTURER & SUPPLIERS. NIMONIC 90 ASME SB 463 STRIPS STOCKHOLDER, UNS N07090 NIMONIC SHEETS, HOT ROLLED NIMONIC 90 PLATE EXPORTER, HIGH QUALITY NIMONIC 90 PLATE STOCKIST, NIMONIC 90 CHEQUERED PLATE EXPORTER IN INDIA. It is widely used and a well proven alloy in high temperature conditions. Nimonic Din 2.4632 Plates is also used in springs operating from ambient temperatures up to 1112 Degree F (600 Degree C), fasteners and components requiring resistance to high temperature and corrosive environments. Machining operations are performed using commercial coolants. High-speed operations such as grinding, milling, or turning, are performed using water-based coolants. Heavy lubricants are used for boring, drilling, broaching or tapping. Nimonic UNS N07090 Plates has good ductility and may be readily formed by all conventional methods. Because the alloy is stronger than regular steel it requires more powerful equipment to accomplish forming. Buy Nimonic Alloy 90 Plates at reasonable price from us. Slovakia, Austria, Bhutan, Serbia, Australia, Nigeria, Zimbabwe, Mexico, Egypt, Ukraine, United Kingdom, Tibet, Canada, Iran, Lithuania, China, Venezuela, Czech Republic, Russia, Pakistan, Morocco, Colombia, Saudi Arabia, Singapore, Lebanon, Gambia, United States, Bahrain, Netherlands, Denmark, Iran, Poland, Iraq, Sweden, Poland, Kuwait, Taiwan, Macau, Kazakhstan, Trinidad & Tobago,Tunisia, Israel, Germany, Sri Lanka, Azerbaijan, France, Vietnam, Chile, Costa Rica, Gabon, Hong Kong, Puerto Rico, Ghana, India, Mongolia, Afghanistan, Mexico, Oman, Argentina, Estonia, United Arab Emirates, Switzerland, Chile, Hungary, Ecuador, Japan, Bulgaria, South Africa, South Korea, Croatia, Romania, Nigeria, Indonesia, Italy, Thailand, Bangladesh, Norway, Spain, Angola, Belarus, Jordan, Qatar, Bolivia, Turkey, Brazil, Greece, Nepal, Peru, Finland, Ireland, Portugal, New Zealand, Belgium, Algeria, Malaysia, Philippines, Libya, Kenya, Yemen, Namibia. Houston, Kolkata, Abu Dhabi, Tehran, Thiruvananthapuram, Visakhapatnam, Thane, Kanpur, Baroda, Cairo, Courbevoie, Bengaluru, Jamshedpur, Mumbai, Manama, Ankara, Noida, Nagpur, Hong Kong, Seoul, Hanoi, Rajkot, Bogota, Los Angeles, Howrah, Lagos, Gurgaon, Indore, Port-of-Spain, Colombo, Ulsan, Bhopal, Gimhae-si, Muscat, Montreal, Mexico City, Hyderabad, Coimbatore, Sharjah, Kuwait City, London, La Victoria, Jaipur, Singapore, Al Jubail, Santiago, Caracas, Perth, Melbourne, Ahvaz, Granada, Jeddah, Dammam, Dallas, Surat, Ahmedabad, Dubai, Toronto, Nashik, Doha, Edmonton, Chandigarh, Faridabad, New York, Vung Tau, Busan, Ranchi, Calgary, Vadodara, Madrid, Haryana, Geoje-si, Sydney, Pimpri-Chinchwad, New Delhi, Riyadh, Pune, Bangkok, Secunderabad, Brisbane, Algiers, Lahore, Milan, Ernakulam, Al Khobar, Ludhiana, Chennai, Chiyoda, Moscow, Kuala Lumpur, Atyrau, Navi Mumbai, Petaling Jaya, Rio de Janeiro, Aberdeen, Jakarta, Istanbul, Karachi, Ho Chi Minh City.